Paul Sherman has released version 13.0 of his Slackware-based distribution, pulling it level with Slack in the version stakes and relying on the slimline IceWM as window manager. Absolute Linux builds on Slackware 13.0 so most package-repos are Slackware compatible. The new release brings the slim window manager IceWM and PCMan FM file manager together. The new TXZ format allows more apps on the CD image, including the K3b burn program (QT 4 edition) and a calendar program, amongst others. The default desktop from Absolute Linux with the Control Center. Sherman tested the distro on an old Dell Optiplex GX100 with a 500 MHz processor and 128 MB RAM and in his opinion, performance was satisfactory. Download (689 MB) from Sourceforge: absolute-13.0.iso. The new Absolute Linux, based on Slackware, provides the IceWM stacking window manager with improved multimedia support. Version 13.0.9 this time fixes more than just a couple of small bugs. 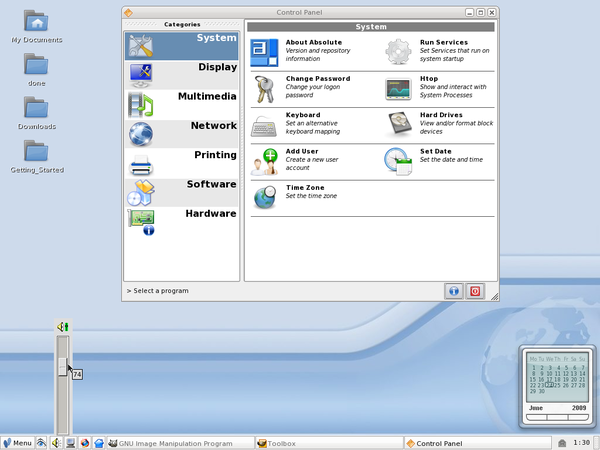 The Vector Linux 7.0, desktop distribution features four lightweight desktop configurations with JWM, IceWM, Openbox and LXDE. 64-bit versions of one of the earliest Linux distros were previously available only from the Bluewhite64 or Slamd64 projects. Now Slackware Linux has finally come out with its own native version. Thorsten Muehlfelder and the Salix team have released a new version of the Slackware-based distribution Salix OS, available for the first time as 64 bit variation.